I remember standing outside last winter while flooding our backyard hockey rink. It was a Sunday morning, and, having already fulfilled my Mass obligation, I was intent on getting a quick flood in before lunch. Off in the distance, I heard the unmistakable clear ringing of a church bell. It was the first time I had heard such a sound in my town. It also turned out to be the last time. The bell echoed gallantly through the chill Saskatchewan air and rested undoubtedly on few ears. For the majority of people were re-creating themselves at the usual Sunday morning chapel known as the hockey rink. The bell relinquished its solitary purpose in life and gave up the ghost. The venue for whom it tolled had just finished one final service. I imagine that that place encountered the usual story: dwindling numbers, expensive repairs, lack of interest. Indeed, financial and faith woes are often inseparable. This was a Protestant building, though there but for the grace of God goes the local Catholic church in another dozen years. The only difference is that the local Catholic church does not have an actual bell to toll. The Spirit of Vatican II long ago delivered the church from employing such an “impediment” to active participation. The Mass should have no bell simplicity after all, if you will permit me just one dad joke. For sale. Church on Main Street. Needs some TLC. Now, it must be realized, culture has not abandoned religion. Indeed, true culture and religion are inseparable. Rather, society has abandoned culture and with it, religion. The town that gathers as one on a Sunday morning to partake in the ritual of yelling at a twelve-year-old referee, running statistical analysis in favor of one’s eight-year-old child as most deserving to make the elite spring team, and working oneself to the bone to pay for this privilege is a town that has lost not just God and culture, but also its collective mind. Consider: the word “culture” comes from the Latin colere, meaning to tend or cultivate. Culture aids in the ultimate goal: quaerere Deum, to seek God. A call to prayer on a Sunday morning tends the soul the way power-skating tends the hockey-player’s body. Both are important, though to quite differing degrees. When the call to power-skate replaces the call to prayer, culture ceases. It no longer is cultivating a community in seeking God. The cultivation of one’s community is stagnated. Moreover, the tilling and cultivating of culture enrich not just the present, but quite clearly the future. The building of the medieval cathedrals is an obvious example, though there are countless others. I once knew a man who toiled for nearly thirty years at building a large stone house in the bush. He was “from old country,” and building such a home is exactly what his ancestors did generations before him. As he neared completion of this impressive home, his wife died. I asked him if it was bittersweet that she would never see the completion of the home. Silly of me to ask. He was building the home as a means to pass on his Northern European work ethic and love of beauty to his children and grandchildren. It was perfectly expected that he and his wife would not see the completion of these efforts. The man sitting at a hockey rink on a Sunday morning, urgently watching a meaningless novice-level hockey game, might ask the stone house-builder, “Why bother?” Why bother passing on hard work, beauty, tradition, and harmony with nature when you can sell 50-50 tickets to help pay for next week’s tournament? The family, or even community, that takes no interest in tending and cultivating, but rather spends its days in recreation void of true direction is one that will have only thorns and weeds to pass on to the future. It is a lazy and lukewarm community. It is a community that neither sowed nor will reap. Returning to the thoughts of an echoing bell heard on that cold winter morning, a church does not fade into disrepair overnight. It takes years of neglect. Years of watering down truth. Years of replacing beauty and noble art with pop-culture fancies. A garden that is not met with daily care, wisdom for knowing what does and does not work, and get-your-hands-dirty effort is a garden that is uncultivated. While my small town may ask whether or not a second hockey rink is needed, the real question to be asked should be, when will the closest church sound its own death knell? Perhaps one day someone will stop, during some intermission at the hockey game, and wonder why – why there is life-and-death competitiveness over whose child makes the spring team. Why it really matters who got credit with that last goal. Why we leave twelve-year-old referees to the jeers of stressed out parents. Why…why no one is truly happy. The arena is a poor substitute as a place of worship and as a sole place of culture. We need more backyard rinks being created, or should I say cultivated – after attending Mass, that is. We need more church bells to ring vibrancy and life and not death tolls of what could have been. We need to cultivate the God of creation and not the god of recreation. Dan Millette is a husband and father of three. 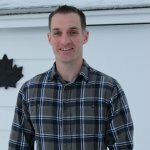 He teaches in Saskatchewan, Canada. Millette is a graduate from Our Lady Seat of Wisdom College in Ontario and has a Master of Arts degree in theology from Holy Apostles College in Connecticut. His personal blog is www.bravestthing.com. The Pope Forces the Question: What Good Is the New Catechism?